Want to know what a great time we had building our Simon Says games last weekend? So great that I forgot to take photos. But had I taken photos, you would have mostly seen the back of heads as everyone diligently joined components using hot metal. Fun, no? To kick us off, I read my new favorite children’s book Rosie Revere, Engineer. I bought it for my daughter, based on the cute cover. It only took one read thru and the huge lump in my throat to convince me it was a keeper. I wouldn’t dare ruin the ending but it serves as a lovely tale of trying and failing, and getting back up to try again. Yes, I read everyone a book about failing. I’ve often read about the need to try and fail, and of course learn from those failures, but I’ve seldom put that into practice – at least not in the last 15 years. Once I graduated from college, it was as if a silent veil fell and suddenly I felt I should know all the answers. At the time, I couldn’t clearly identify what had changed, but looking back, it was as if the stakes were suddenly much higher and failure was to be avoided at all costs. And it has taken me a while to shake that notion off. I’ve come around to believing in the cliche, that the fun is in the try, as much as in the success or failure, or at least I hoped I could get everyone to buy into that idea for the next two hours. Oh, but first I made them cut their own wires because a) I am lazy and didn’t do it ahead of time and b) sharp wire cutters are fun. Now there was nothing left to do but to do it. 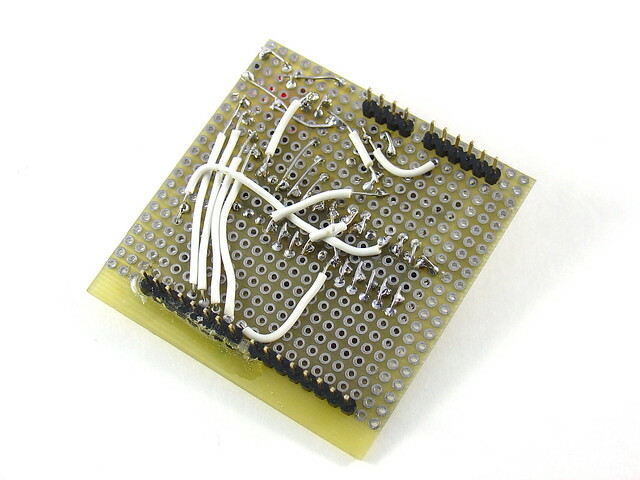 Students sat looking at their soldering setup like, huh, I’m really supposed to touch this? Yes, you. You in the conference room chair who signed up for this class. You. now. really. And one by one, they each did. With each joint and each wire, you could feel the confidence building. Then a pause. Time to move away from the perfboard and onto our ‘real’ project. There seemed to be an invisible barrier when it was time to move to our final canvas. I could see the fear about being wrong in their eyes and I knew it had to go. Luckily the first “real” joint was a confidence booster, a simple resistor with more than a wide berth for the iron. Flush with the success of the first join, students progressed on their own, joint by joint. Not to say there weren’t a few hiccups, like a melted switch here or a burned out buzzer there, but by the end of the class, after some fine tuning and squeezing of the battery mounts, we had eight working Simon Says games. Some may have been louder than others, but all technically worked. After we finished, as a bonus we toured the Catylator makerspace that recently opened in the basement of the World Building. We’re hoping to partner with Catylator in the future, as they build out their membership base and programming, and would love to hear what our members are interested in doing. Another intro class like this one? More hardware? Let us know in the comments! It was a great workshop and I had a wonderful time helping Catherine. Thanks for inviting me! Soldering is one of my favorite activities and I love seeing how engaging other people find it. I’m teaching a workshop on micro-controllers at Catylator in the evenings. It’s such a great space. Stephen is now offering hourly and daily rates so you don’t have to pay a monthly membership fee to use the great equipment. Previous Previous post: Tech Your Weekend With “Code: Debugging the Gender Gap” and an LED class with Threadwitch! Next Next post: Learn to Solder!